That's looking great! I hope to have an update tomorrow. Sorry its taking so long. Working on a CPA certification and its taken over my life. Thank you, your instructions have been great. No worries on time, life is busy. I'm a full time single Dad of a teenager, so I can empathize with the lack of precious "me" time. Time to get into yards arms and running rigging. This is a little tricky since parts of the running rigging works off of other parts but little by little it comes together. First lets start with the gaff. When it some to yard arms I prefer to tie them on instead of drilling holes. This keeps the overall strength of the model while enabling the use of parts that are more to scale. One of the primary knots I use for this is the cow hitch. This is particularly useful for square rigged sails. You can tie a cow hitch on the yard arm and then use the ends to tie the yard arm onto the mast. I used this same method for the gaff. 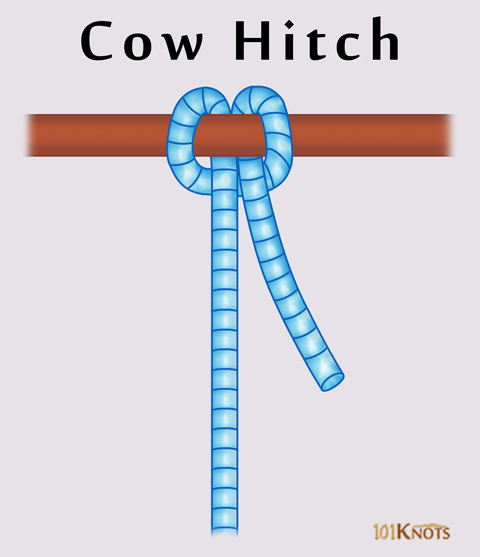 Tie a cow hitch on the gaff and use the ends to tie it to the mast. 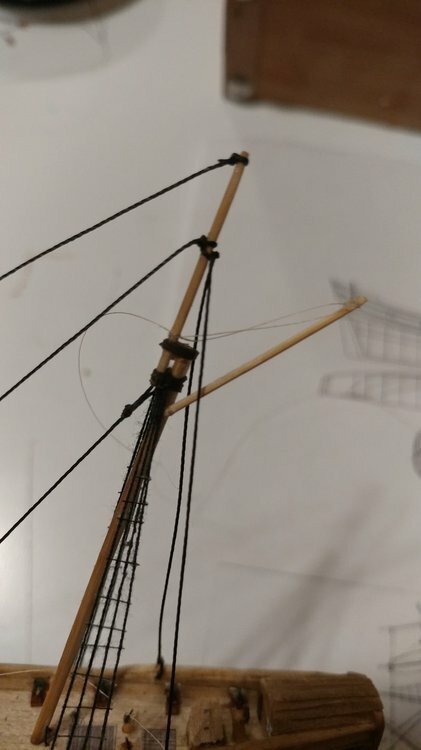 I find it easier to tie the knot around the base of the mast then slide it up into place and glue the string to the mast. The gaff should be able to raise up and down and move side to side on the knot. For the halyard on the gaff tie a thread block on the end end of the gaff. Then tie a string to the mast just above the cross trees. Run it through the thread block the tie it to the mast at the spot you started. Cut off the excess. If you want it to be slightly more realistic you can run it down to the bulwarks where it would be tied off. 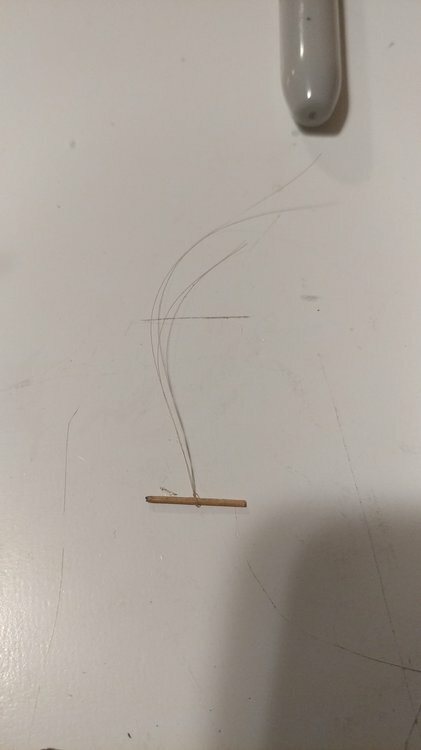 This is a bit over kill so I just cut it off. The important part here is the length of the gaff halyard. You want the halyard to be tight with the gaff at the angle it is on the plans. 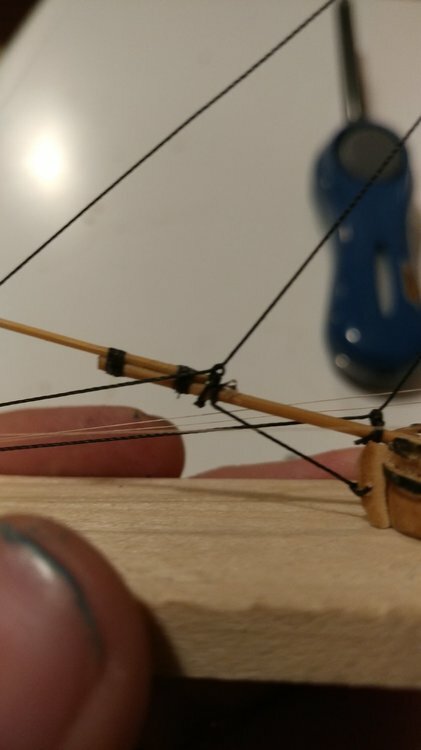 Different color and diameter thread for this rigging? Now we move on to the boom. Remember the hole we drilled in the mast while putting it together? This is where its used. 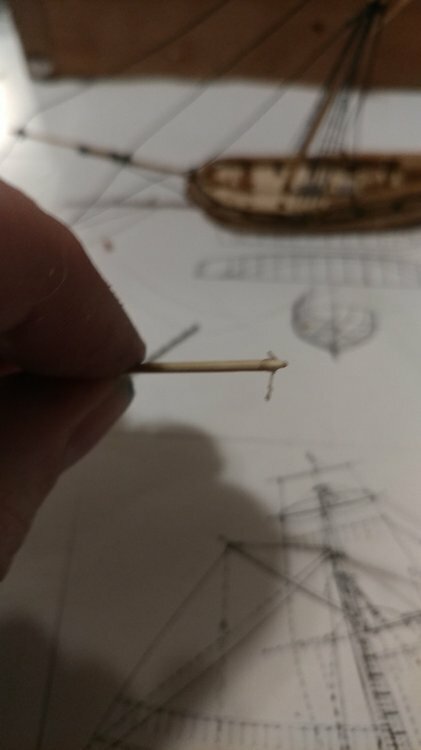 You could use a thread block for this as well but since near the base of the mast, where it is thickest, I determined a hole would be fine. Tie a line to the end of the boom that will be next to the mast. That line will go through the hole in the mast and out of the bottle. The idea is the boom will be able to separate from the ship and allow the sail to roll up. 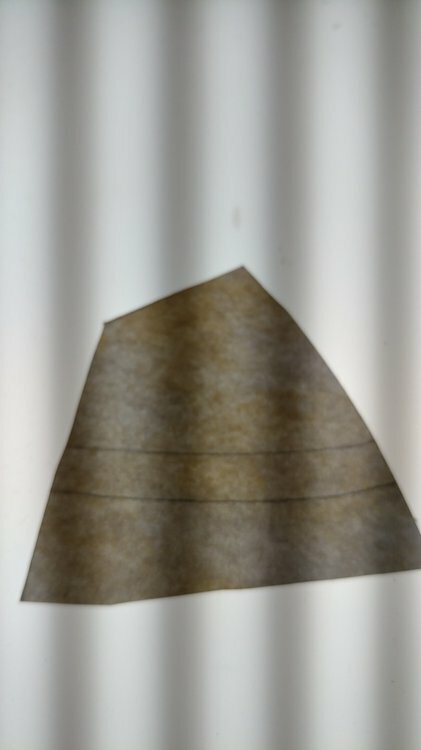 Since I'm planning paper sails this is important to the sails don't crumple up. From here I tied a couple thread blocks on the other end of the boom. As I simplified the rigging I found you only need one. This is where the rigging on the plans can differ from the rigging on a ship in bottle. 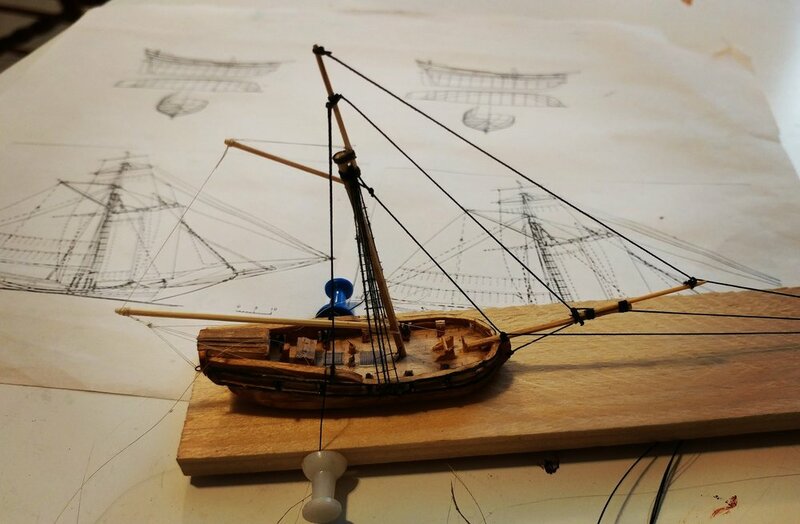 With some effort you can copy the rigging in the plans exactly. 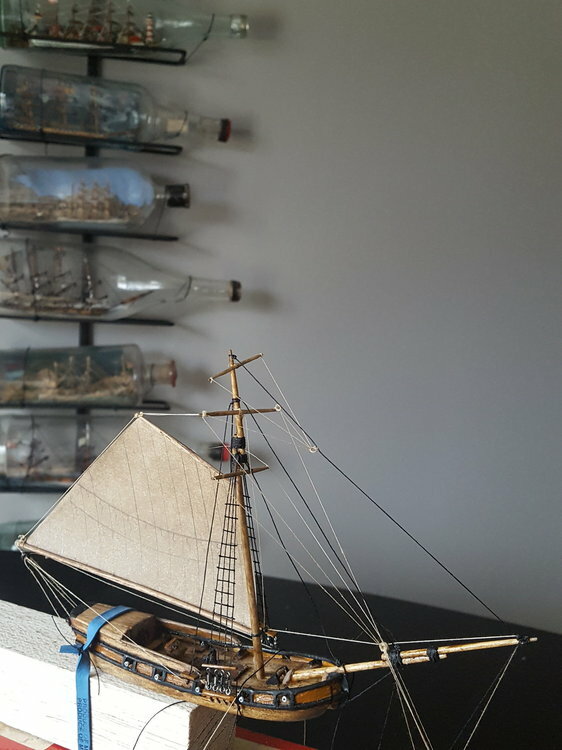 This is supposed to be a simple model though so I'm going use a mixture of planned rigging and simplified ship in bottle rigging. According to the plans there is some blocks on the transom that help control the boom. I made a small eye bolt for this block and glued it in a hole drilled into the transom. I did two on either side of the Windows. You can do one in the middle as well. I suspect the actual ships would have two so they can quickly adjust the boom while tacking. I decided to use two for mine but one central eyebolt would work. Here's another place I differ from the plans. It appears on the plan that the line runs from the block at the transom to the block at the end of the boom, back to the transom block, then back to the boom block then it runs to the bulwark. I initially tried this but I couldn't pull the lines tight very easily. The added lines add a lot of strength on the real ship at a point that holds a lot of pressure. This isn't needed on a ship in bottle so I reduced the number of lines running back and forth. 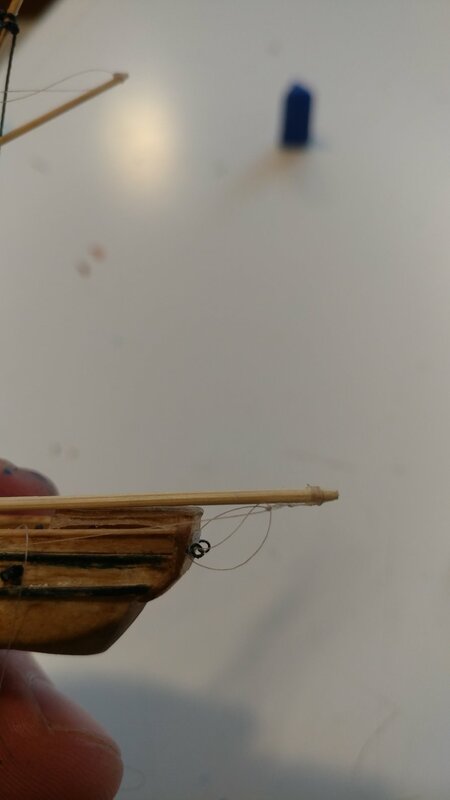 I tied the first line to the thread block on the boom, ran it through the transom block, back to the boom block then to the hole drilled in the bulwark. With one less line it pulls tight more smoothly. The line going in the bulwarks then runs out of the bottle. 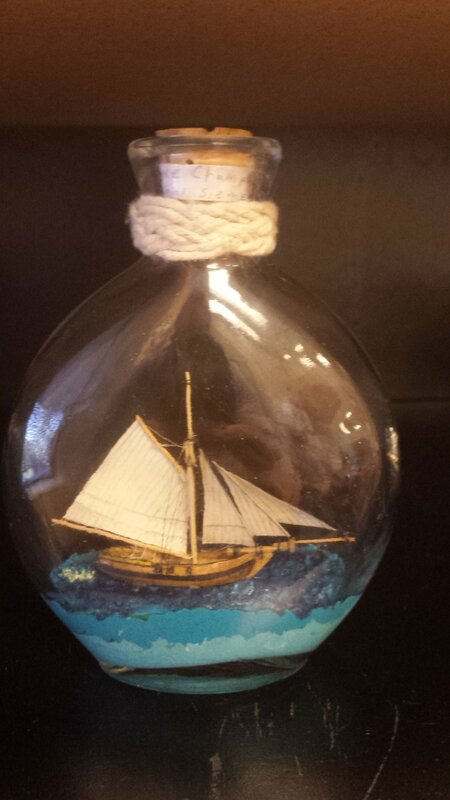 It will be tightened and glued down after the ship is in the bottle. If you only have one block in the transom you only have to do this once. I opted for putting lines on either side. One more part that differs from the plans. Technically there is separate lines used to pull the gaff tight and life the boom up. This can be consolidated by tying a line from the gaff to the boom. This also tightens up all of the lines. You can see how the yards will be set at this point. Good catch Spanky. 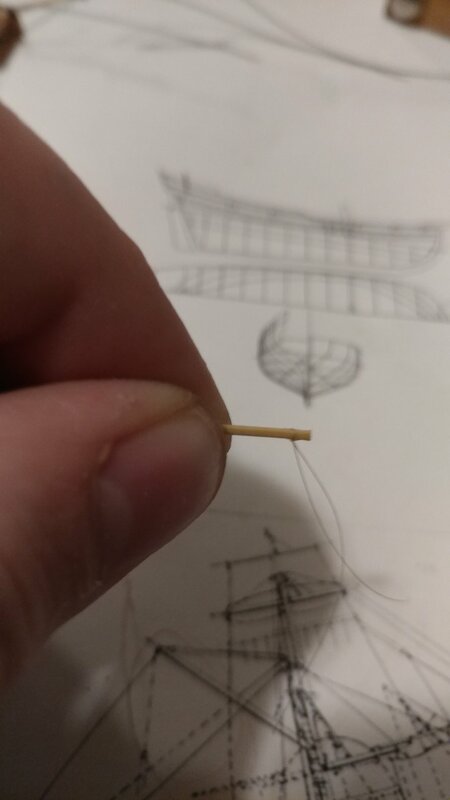 Yes I use a thicker black thread for standing rigging and then a thinner 8/0 fly tieing thread for running rigging. This is because the standing rigging was used for support and they would have used a thicker rope. Since it didn't move the standing rigging was covered in tar to preserve it. 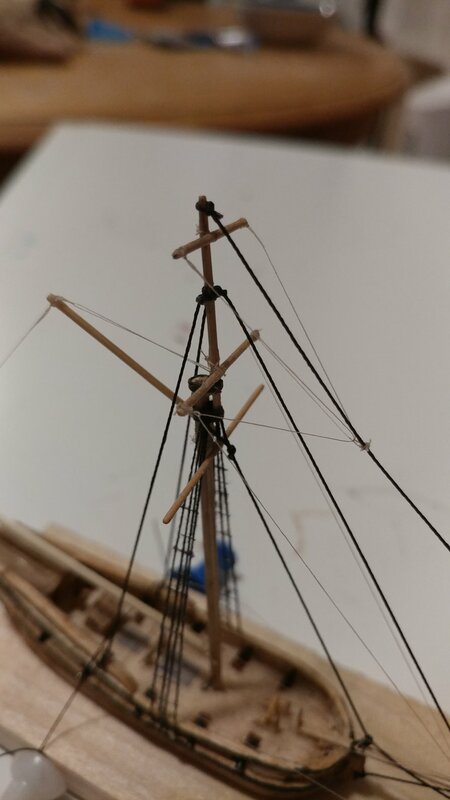 The running rigging had to move through blocks in order to adjust sails. 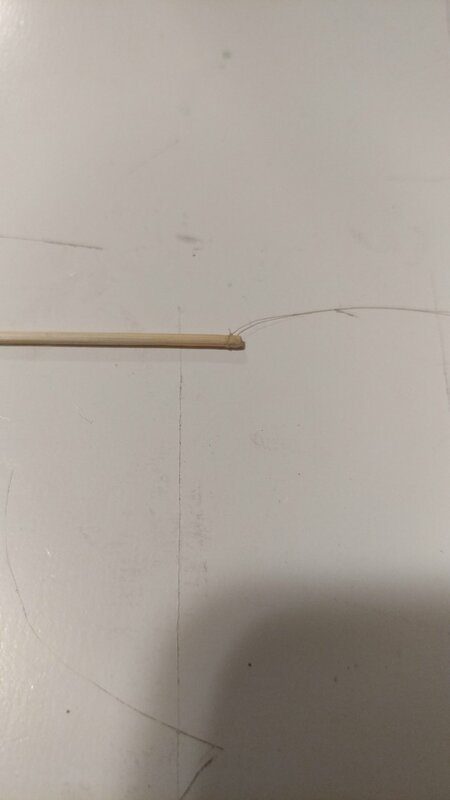 It also had be thin enough to hold onto an pull. So I use a thinner brown thread to simulate the running rigging. This next part has a lot of options all depending on how detailed you want to go. If you want to keep it simple leave off the topsails all together. In higher winds these would have been removed and it looks fine with out them. Here's an example. 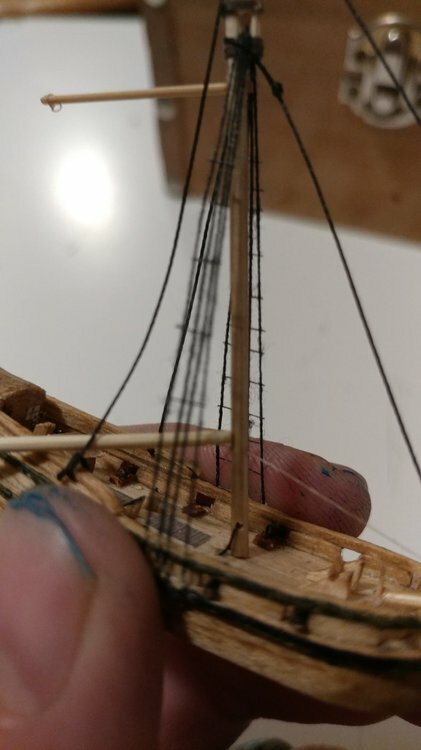 If you want to add more detail though the top sails look great. To put on the yard arms use the cow hitch and tie the yards to the mast. 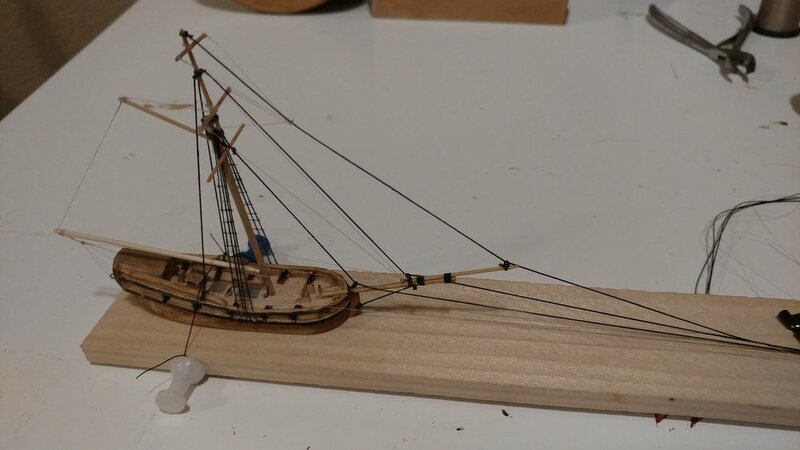 Running rigging will be used to keep the yards straight. There's a lot of options on this part as well. 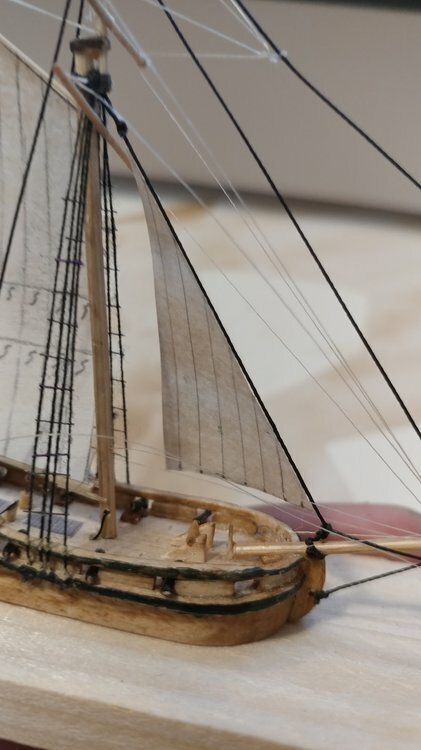 The Bermuda sloop is interesting because the running rigging is rigged forward instead of aftward like most bigger ships. This picture is a great example. For my ship I decided to rig the top two yards on the same lines. This is somewhat more advanced but it shows the type of things you can do in rigging ships. First you'll need a few thread blocks. 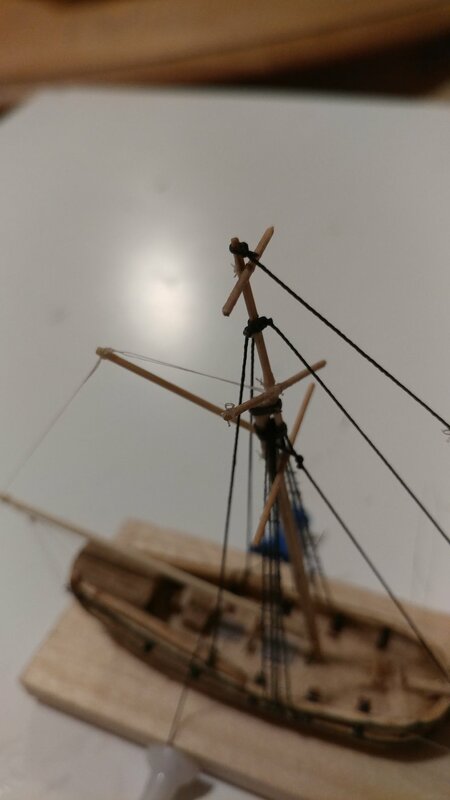 One just behind the middle thread block on the bowsprit, one on the stay line at about the same height as the cross trees, two on the ends of the middle yard arm. Here you can see where the running rigging is going to go. 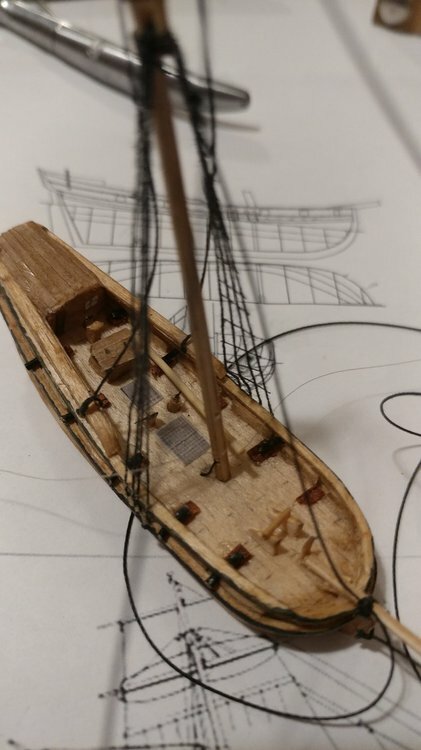 Start it at the ends of the top yard arm, run it through the thread block on the stay line, then through the thread blocks on the middle yard arm, then through the thread block on the bowsprit. There's a trick you can do on this part. Its less realistic but reduces the lines coming out of the bottle. Tie the running lines to the end of the top yard arm, then pull them through the thread block on the stay line, last tie the ends to the middle yard arm and cut them off. Letting the lines slide through the thread block you can adjust the tack of of the yardarms. 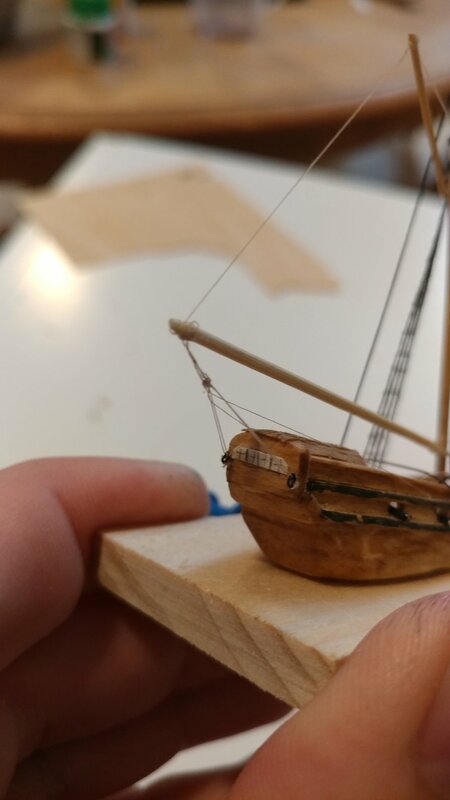 If you want to go more realistic run the lines down to the bowsprit then drill a couple holes through the hull just behind the front bulwark and on either side of where the bowsprit attaches to the deck. Run the lines through these holes and under the ship. 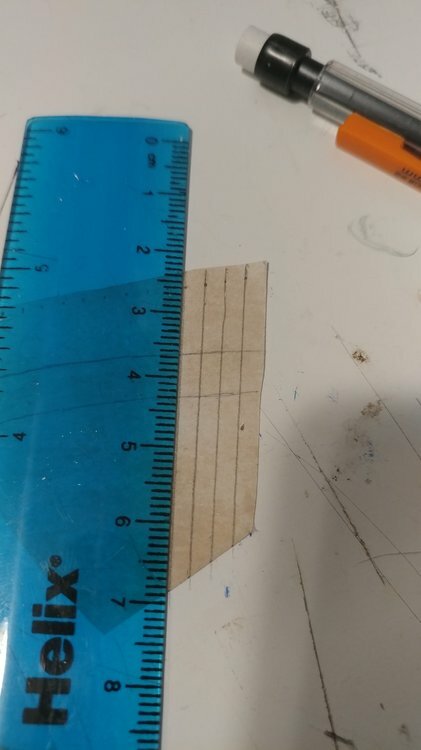 The advantage to this method is you don't have to be precise in cutting these lines because they will be under the sea. For the bottom yard tie lines to the end and through the same block on the bowsprit and then back to the holes in the hull. At this point the ship is ready for sails. 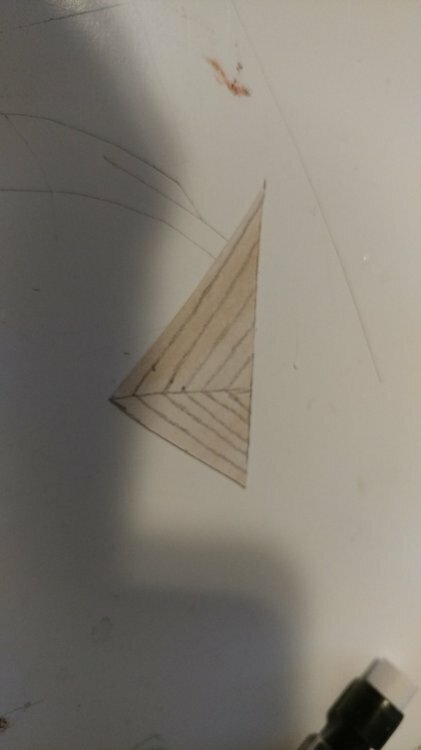 I started with the main sail. The first thing I did was to get the paper ready. There are a lot of different methods for coloring paper, coffee, tea, or paint works. I've found a very light staining of golden oak gives a good weathered effect. 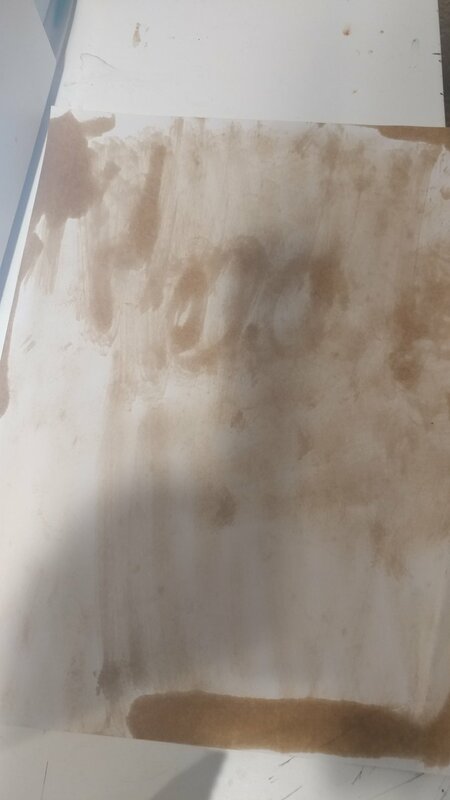 I wipe off the excess on the edges and lightly stain the middle. 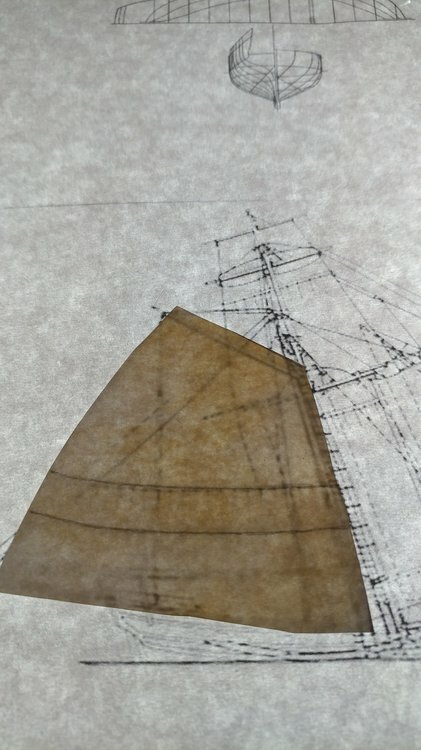 From there I traced out the sail against the model. 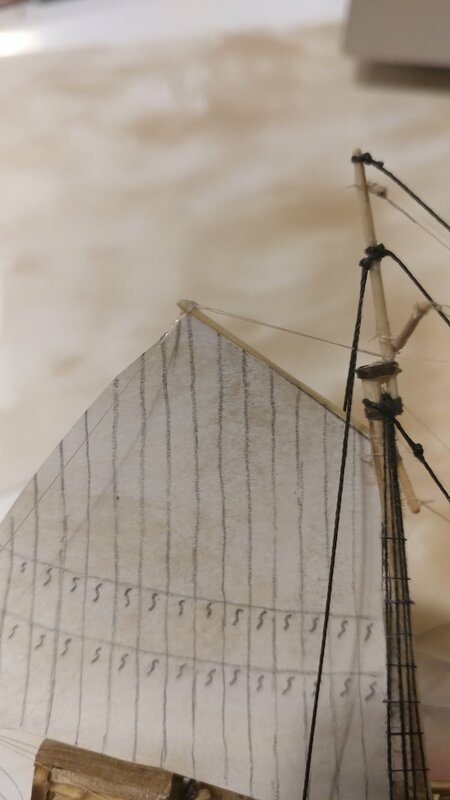 I like to give a wind filled look which means making the sails a little bigger than they are in the plans. Once its cut to size I draw on the details. I find a light board works well for this. You can go with out though. I used the light board to match up the reefing lines. If the wind is to strong the sailors would bring in the sails. 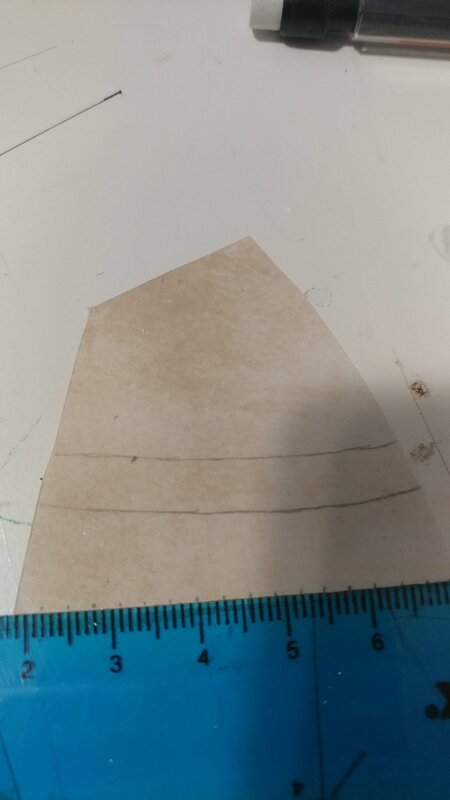 These lines are where sail would shortened to. Once the first are on flip it over on the light box and trace the other side. 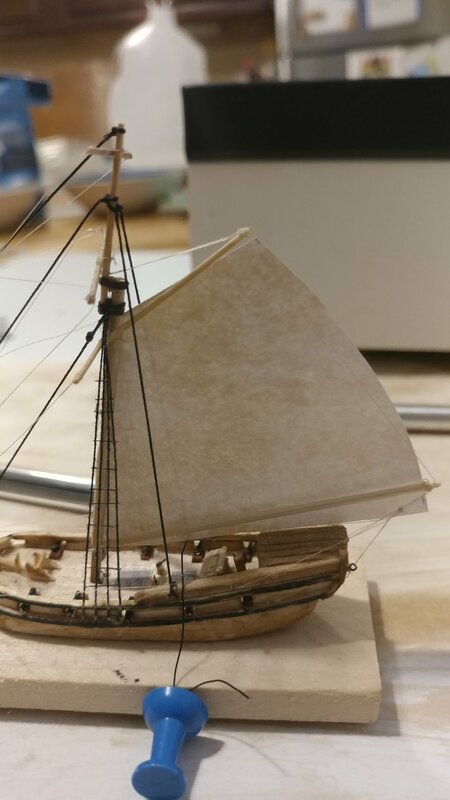 After that I work on the sail panels. 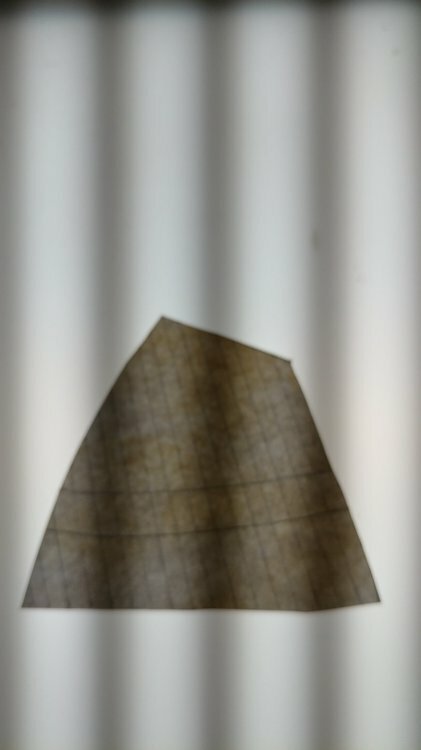 It would be almost impossible to weave together whole sails, they are far to big. So they wove together panels that were sewn together. 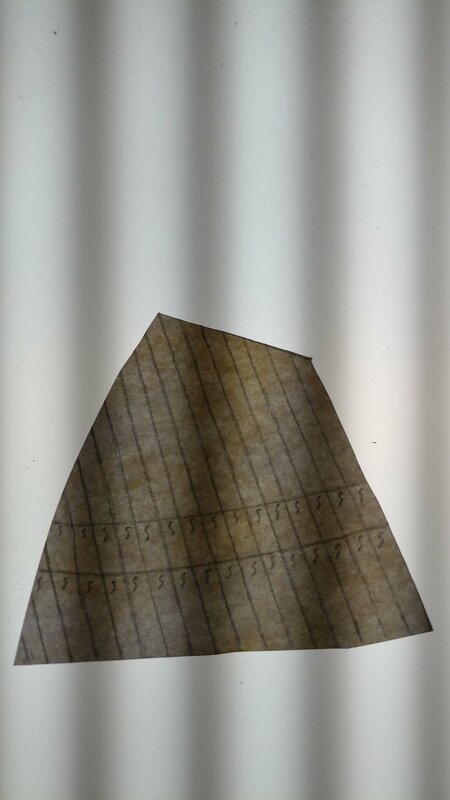 Some one could probably find the general width of sail panels and get them all to scale but its not needed. I chose a width that looked good and went with 3mm apart. 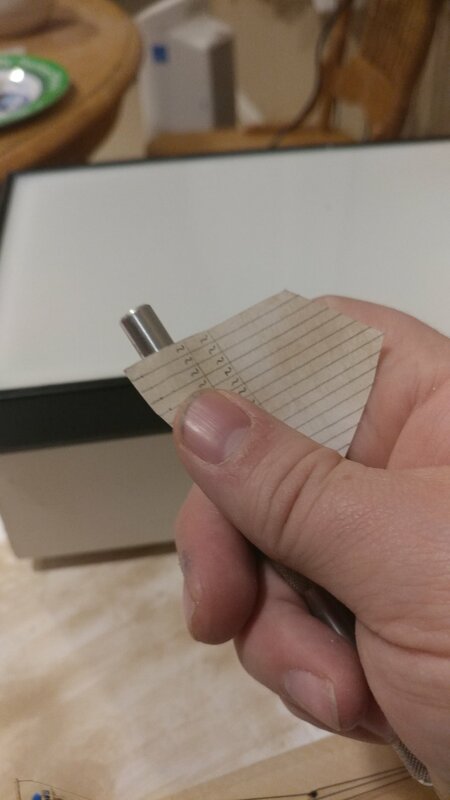 I marked the bottom edge with a line every three millimeters. Then drew a line parallel to the edge next to the mast. Once that was done I flipped it over on the light box and traced the other side. Then it was time to draw on the ties. 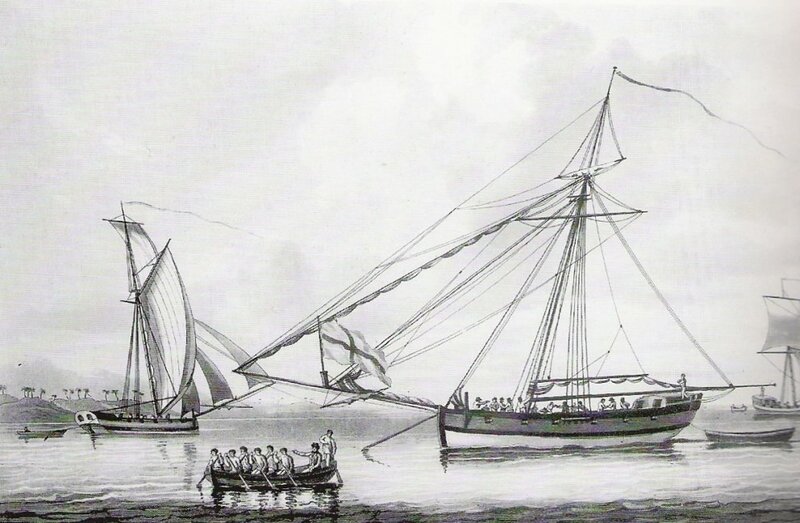 When a sail is reefed ties on the sale are used to tie it down to the boom. I make these ties by putting a little "s" mark on each panel. Make sure to do both sides. Then I curl the sail. This is what gives the wind filled look. Take the sail between a pen or dowel and your thumb then pull it through. This will curl the sail slightly. Make sure to choose which tack you want at this point. Then glue the sail to the gaff and boom. Technically there would be hoops the connect it to the mast but I'm leaving those out. DSiemens, this is a great choice for learning, thoroughly enjoying this build. It really is a beautiful vessel, partly because of it's simplicity. I think yours is turning out much better than mine. Absolutely beautiful work. I've got mine in the bottle. Updates on the final process coming soon. Thanks, it is however 3 times larger so I have a lot more room, and your CPA is your priority right now. Really great thread though. As a newbie, it opens your eyes a bit to how things "should" be done. Hopefully I can get it in the bottle O.K. I'm really happy to see other builders trying this build out. If nothing else its a proof of concept. 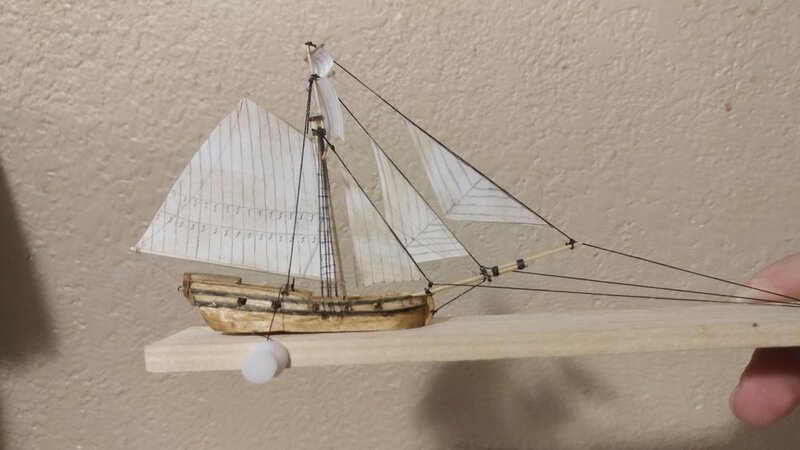 Really you can use the same method that this build uses and build any ship you want. There's a million other methods out there its all about finding what works. This type works for me. As far as the rest of the sails its the same method. Cut them out, draw on the panels and give them a little wind curve. Making sure to follow the same tack. I like to give the jibs some fun looking panels. I'm not sure if its historically accurate but i like the look. Glue the jibs right to the stays. I give a bit of room between the jib and the thread block. The last thing you want is to find you can't pull the line tight because the jib has stopped the line at the block. 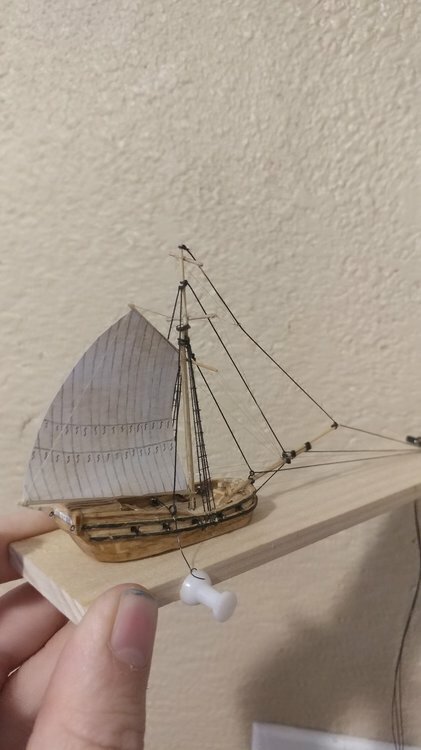 I didn't put any reefing lines on the square sails. These sails would have been hoisted up in low winds so reefing them would mean just taking them down. Which as mentioned before if you want to simplify this build further leave off the square sails all together. It still looks great with out them. I ended up moving the middle spar a little higher to fit the sails. 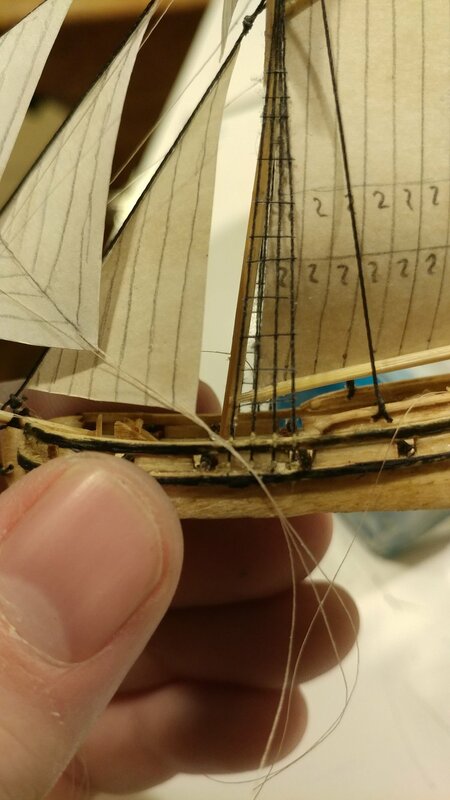 As far as the square sails go I hive them a curl and glue what would be the top front of the sail to the bottom of the spar. This allows the curl to go out and look like it has some wind. 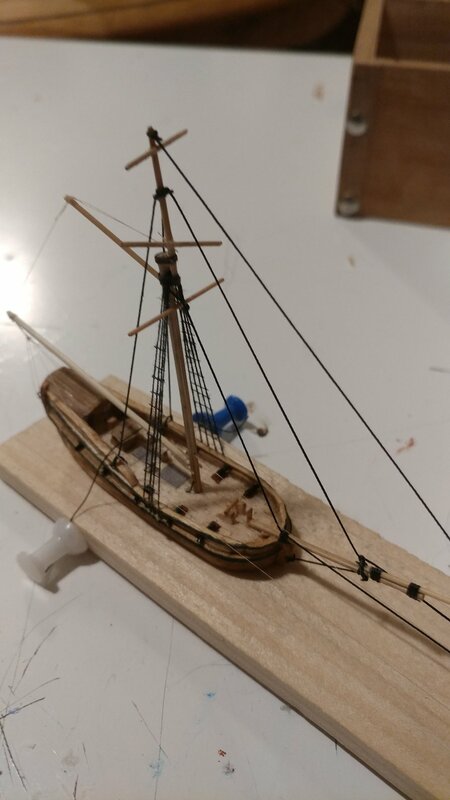 The last lines I glued on were the jib sheets. Theres a trick to these so you don't have to have three more lines coming out of the bottle. First get your jibs set up so they are catching the wind. To do this twist the stay lines and let then losses and tighten them. You'll notice as you do this the jib rotates around the line. This can be done while its in the bottle as well. Get the jibs where you want them then glue a line at the open corner of each jib. 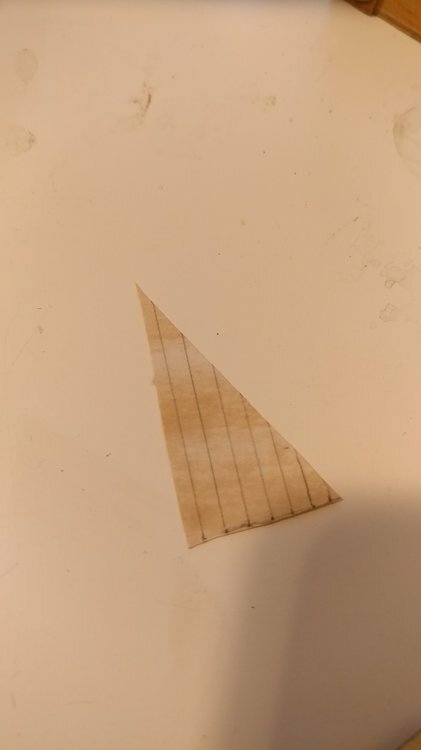 Bring the three lines together and glue them all together. Cut off the excess With enough left to tuck behind the bulwark. You can glue them to the bulwark once its in the bottle. Since the jibs naturally pull the line outward it goes right into place once its tucked on the opposite side of the bulwark. DSiemens on page 1 of your tutorial, you mention about breaking the grain using a pair of tweezers. Wouldn't this leave a mark on both sides of the bulwarks? Could you possibly post a picture of tis procedure? 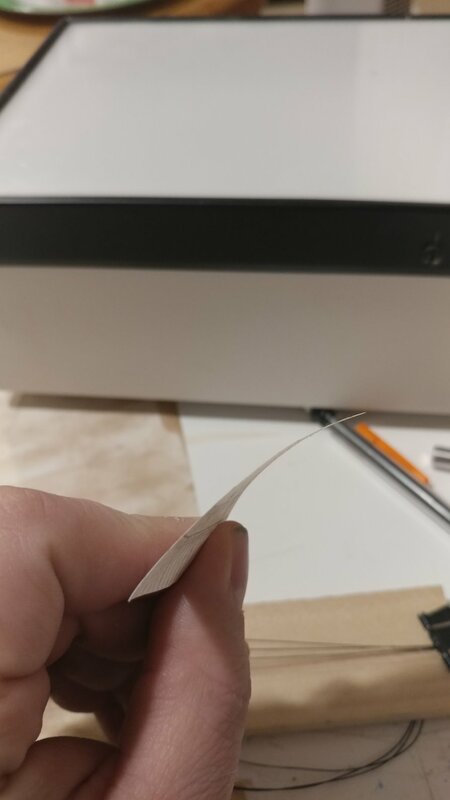 It does leave a mark on the inside edge but not the outside edge. I will get some photos and show what this looks like. 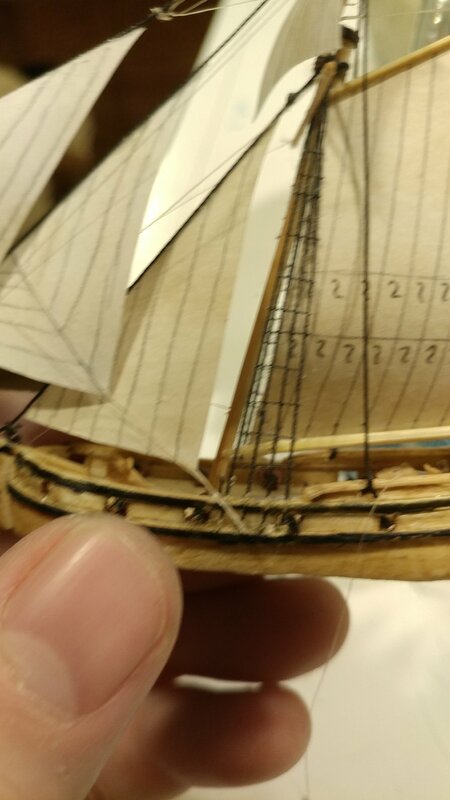 The advantage of the ship being in the bottle is the inside edge is hard to see so I"m not worried about anyone seeing the marks. Also a little bit of sanding will diminish it slightly.